Users frequently ask us whether they can use their iPhone’s or Android-based smartphone’s camera as a webcam. The answer is yes. Moreover, you can do it easily. You don’t even need to connect your smartphone to the computer with a cable! Read the step-by-step instructions below. Using a smartphone camera as a webcam: How does it work? First, download AlterCam and install it on your computer. It will take only a few mouse clicks. AlterCam will run automatically as soon as you install it. Now you need to install the IP camera application on your smartphone. If you have an Android-based smartphone, install this application (it’s freeware). 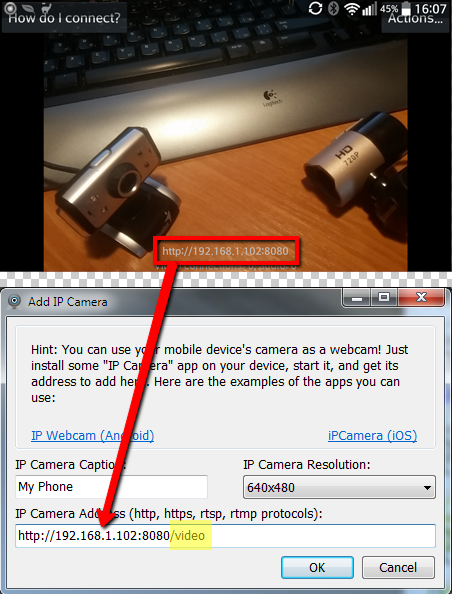 If you have an iPhone, iPad, or iPod touch, install this application: iPCamera - High-End Network Camera. It costs only $1 (we couldn’t find any working freeware application). Android: Launch the IP Webcam application on your smartphone. You will see a list of settings. The app usually works fine with the default settings, so scroll down to the bottom and tap Start server. iPhone/iPad: Launch the iPCamera application. At the first launch, you need to allow the app to access the camera. You can change the settings (at your own risk and peril) by tapping the Configure button, though iPCamera works fine with the default settings. Launch AlterCam on the computer. In the source camera drop-down list, select “Add IP camera.” Now please pay attention because the following step is important! - Use AlterCam to connect to the smartphone camera. In the IP camera adding dialog box, enter a name (an arbitrary text) for the IP camera. The IP camera resolution depends on the camera settings in the application used on the smartphone. If you do not know the exact resolution, do not change this parameter. Click OK. If you did everything correctly, AlterCam would display a video feed from your smartphone’s camera. If you do not see that video, check the previous steps. Now you need to select AlterCam’s virtual webcam in the application where you are going to use your smartphone’s camera, that is, in Skype (in the settings) or other video chat app. As you can see, AlterCam easily turns your smartphone’s camera into a webcam! By the way, you can overlay the video feed from the smartphone camera on the main video. That is, you can set the webcam on your computer as the primary video source, and the smartphone camera as the overlay video source (to display a reduced picture over the main picture). Or you can stream the video of your desktop with the overlay video feed from the smartphone camera. As you can see, AlterCam can do pretty much anything. :) To overlay the video feed from the smartphone camera on the main video, click the “Add IP camera” button on the Overlay tab. Hopefully, this article will be helpful. See you!